We arrived in Hiroshima very aware that we were only spending one day in this city, so headed straight for the Peace Memorial Park. This is the centre of where the American Atomic Bomb was detonated on 6th August 1945. Towards the end WWII, the Germans had surrendered and the only war that remained was the Pacific War - Japan vs. the Allies. The Japanese didn't see defeated as an option and American had planned a full scale attack on the Japanese Homeland, whose resources and military equipment were slowly getting more sparce. This plan had a huge expected casuality toll for American Soliders. Americas "Manhattan Project" was finally completed and they had access to nuclear weapons. It was decided that a suprise nuclear strike upon Japan would be the most effective way to force the country into submission with the smallest loss of American lives. America gave Japan one last opportunity to sign a peace treaty with an ultimatum that if they didn't Japan would face "the inevitable and complete destruction of the Japanese homeland". When the Japanese rejected the treaty the Americans planned to use their untested nuclear weapon - the Uranium bomb (having only tested a plutonium bomb so far). In an attempt to save face (if the bomb didn't work) and in an effort to ensure the POW weren't moved to the Hiroshima, the Americans did not warn Japan of this strike. At 8.15am on the 6th August 1945, Enola Gray flew over the city of Hiroshima dropping the first ever nuclear weapon on a city. 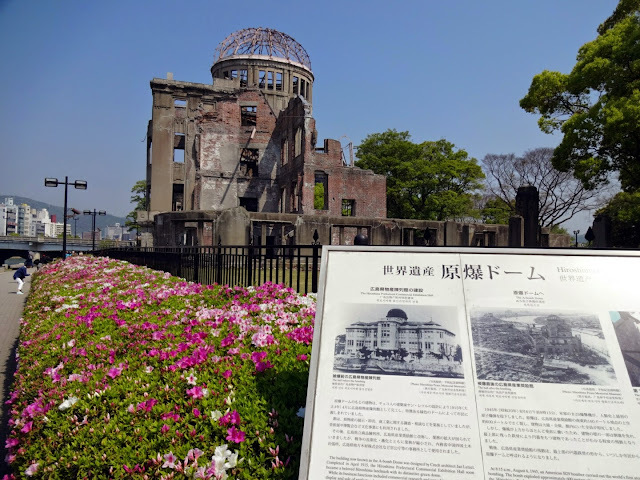 The first thing we saw when we reached the Peace Park was the A-Bomb Dome. Due to the direction of the bombs detonation (downwards) the prefectural hall (which was earthquake stable) still stands today. Surrounding it are before and after pictures, showing a vibrant hall one day and a horror movie deserted town the next. It was shocking to see just how different a building could become in such a short space of time. When the bomb exploded this building would have instantly gone up in flames - instantly killing everyone inside of it. Around the park were several statues and memorials to the bombing. These included a children's memorial that was created after the death of a girl who was exposed to the radiation at 2 and died from Leukemia 8 years later. Her friends and school friends raised the money for the memorial for all the children that were effected by the bomb. At the far end of the park stood the Atomic Bomb Museum. 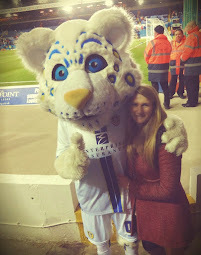 This may have been the worst place I have ever been. The museum tells the story of the bombing, the aftermath and even educates about how nuclear bombs work and the after effects of radiation. The most harrowing part of the museum were the stories about people who were effected by the bomb. Several of the stories were about children who were seriously injured and died not long after the detonation. There were pictures on the walls showing charred bodies and effects of the radiation of some of the immediate survivors. There were clothes in glass cases, showing how the blast burnt through clothes leaving huge holes and speculating about the damage done to the skin of the wearer. For approximately 2km around the point of detonation, all buildings (most were made of wood or had wooden frames) were completely vaporised by the bomb or burnt down due to the fires created from the heat of the explosion. 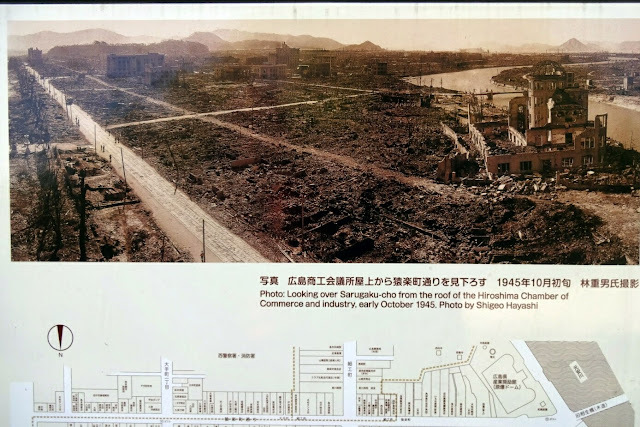 It is thought that 70,000 people died immediately during the explosion and a further 70,000 died as a result of their injuries or radiation in the following five years - most of these people were civilians, women and children. A shockingly high proportion of the bodies of the dead were never found. We left the Museum feeling quite upset and tried to find food. A local delicacy was recommended to us and a restaurant that served it even had a vegetarian menu. The food was really tasty and surprisingly filling. 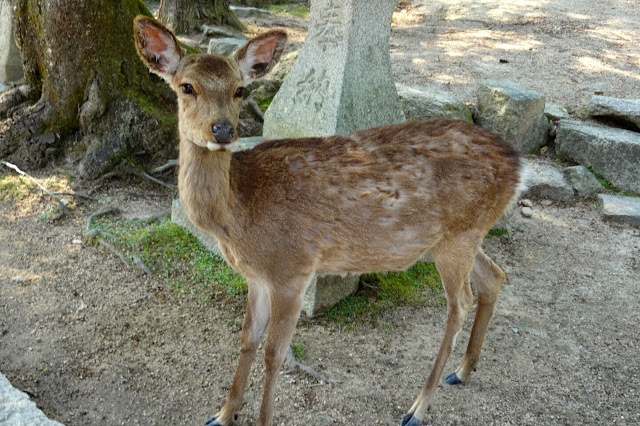 In the afternoon, we went to Miyajima - a small island off the coast of Hiroshima. 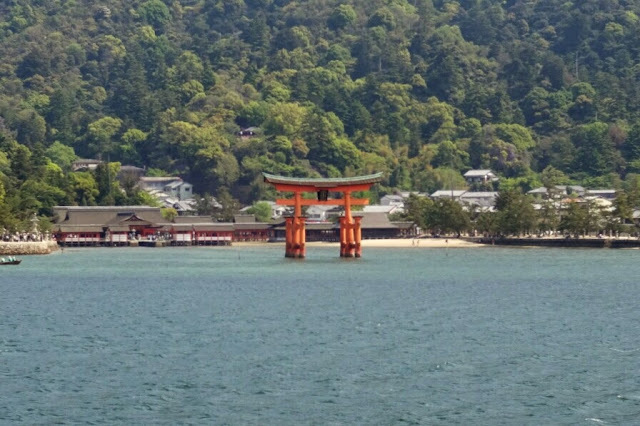 This island is famed for its free standing Torii gate that appears to float in the water at high tide - the Itsukushima Shrine. 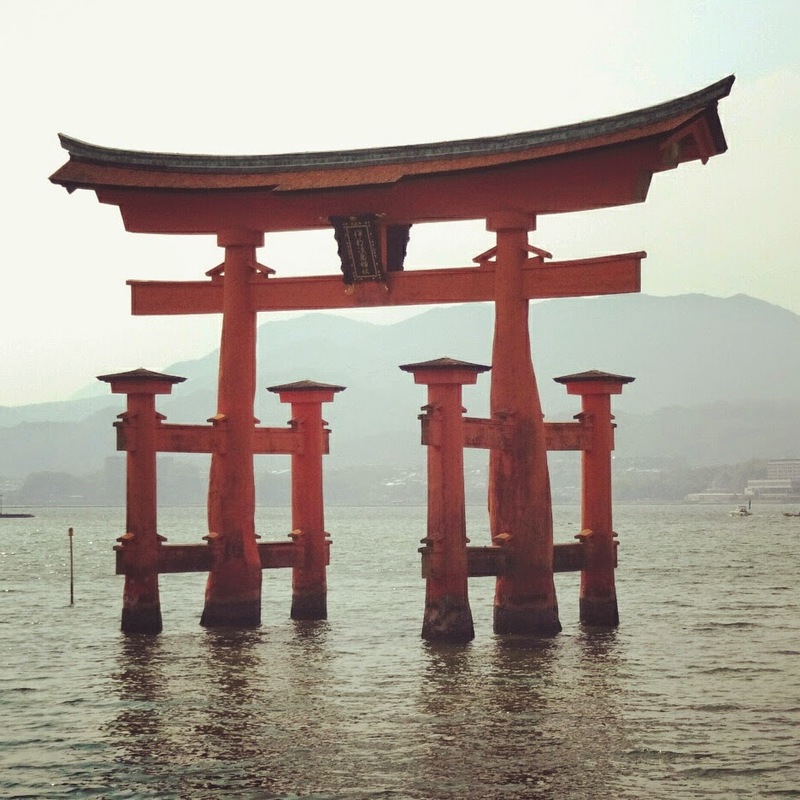 The gate was the same bright orange that we found in Kyoto and people flocked to it to take selfies. 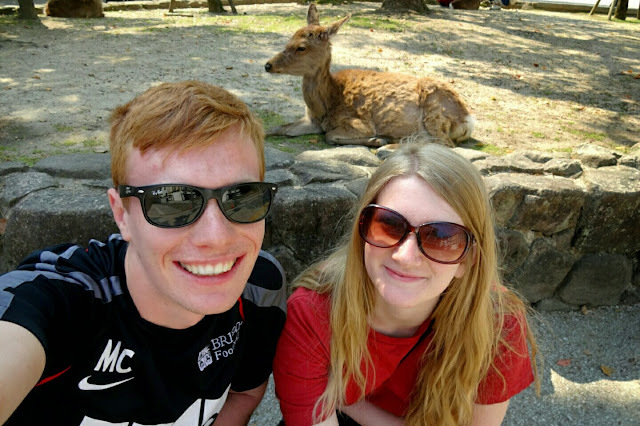 By far the best part of this island were the wondering deer that followed tourists - offering to help them eat their food and even their maps! It was strange to see such a reclusive animal in England be so used to human interaction on this island. The trip there was made even better by the fact we could use our 7 day JR rail pass to get the train and ferry for free! I have always been against war and violence and death always upsets me. 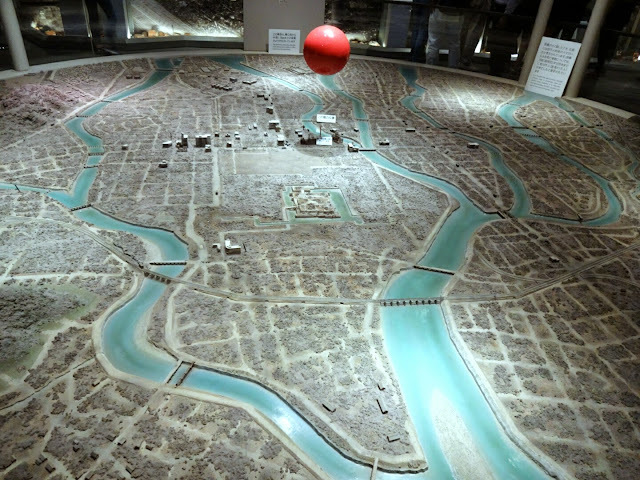 Seeing the state of Hiroshima after that bomb was dropped was unreal. The ground was scorched and trees destroyed. All life looked like it was gone. 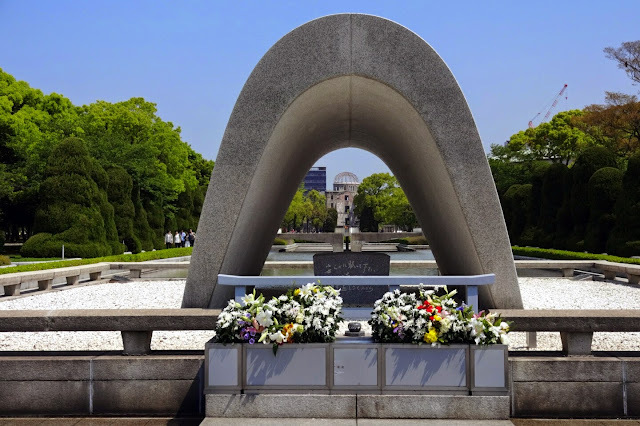 Hiroshima asks for world peace. It asks that nuclear weapons are never used again, that people will never again face the fate and the future that they did. Families were destroyed and even the lucky people who survived the initial attack have suffered with long term effects for their entire life. Stories from children who survived and witnessed the aftermath should be enough to prevent something like this ever happening again. I will never understand how it was agreed to release a second bomb over Nagasaki after witnessing what happened in Hiroshima. When the bomb was released, we had an understanding of the effect of radiation poisoning but never at this level. I agree with Hiroshima, that a weapon of mass destruction like this should never, ever be used again.